Moving into the second week of August and already we have implemented save/load into Alpha. Come check out see what everyone worked on! This week I’m back to working on campaign (Yay!) and trying to tag team with Alex on the remaining issues and improvements we want to release as part of update 3. Here is a sneak peak of some of that effort for the alternate ending. This extended subway entrance will eventually be a full fledged multiplayer map and explorable in the hub outside your apartment where you will be able to creep your way through looking for resources before you make your way back home to your apartment. Next I’m pleased to announce we are adding at long last another zombie archetype to the game! We call him the “soldier zombie” due to his obvious appearance. The soldier zombie has more health than a regular civilian zombie, and his helmet makes him a bit tougher to deal with since helmet shots will inflict zero damage to him, so you must shoot him in the face to land a head shot. As you might have noticed, the soldier zombie might be carrying more than just the Contagion virus! 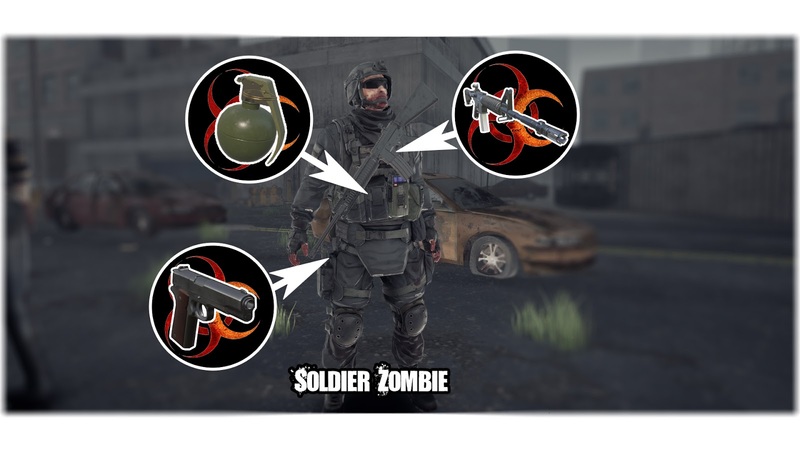 The soldier zombie has a random chance to be armed with a primary weapon, a pistol, a grenade, ammunition, or all of them at once! Pick his pockets while he’s still “alive” or after you’ve dispatched him, the choice is yours. This week was pretty good for me, I was able to finally complete Slot Saving, I took extra care with it because I didn’t want to just put something out that would break the game and also fixed a few bugs that have been bothering me for a little while. Except the elusive duplication of keycards, that’s still there...I’ll squash it one day as soon as I find it. I started to set up my PS4 devkit (and associated software) in preparation to run the Demo through it and seeing how good or bad it will run on it. Hopefully not too much customization will be needed. I know I’ll need to get drawcalls down to roughly 1000 from the research I’ve gathered, mainly since that PS4 CPU is pretty weak. I’ll employ as many tricks as I can to get it running at the very least the bare minimum of 60 FPS. My goal though is definitely trying to get it to 90 if not 120FPS, but that will require completely rewriting a bit of UE4’s source code (which I have to use for the PS4 SDK). I also bought a PS4 Pro from GameStop because I couldn’t test out any of the retail games I bought (along with my AIM Controller) on the DevKit (why Sony, why?!). So I will be doing a lot of research in how others have utilized the Dual Shock, Move and AIM Controllers. My biggest concern here is for the Dual Shock controller, but I’ll see what others have done and figure out a way. Finally, I put out an Alpha build on Steam for folks to try out all the latest goodies. Along with help from Jason and Paul, I have been working on tightening up the scripting on the latter half of the Outbreak mission! The entire "good" ending path is due for a major overhaul, including interaction with the NPC military, in order to make the whole thing make much more sense story wise. Along with actual game play changes, we implemented an NPC Humvee mounted machine gun that targets the huge flow of zombies that start coming out of the woodwork at the very end. The "bad" end is also getting some love; Manuel will be a much more functional character and hopefully make more narrative sense as well. I spent a good portion of this week on optimizing audio to boost performance further. I balanced the Streaming Audio, cut down on Fades and Event Calls, and updated the Blueprint I created to clear unused banks before loading the banks that level will specifically use. I also completed including all Volumes and Portals for our existing levels, updated a lot of the audio in the Campaign maps, Hub, and Multiplayer. I’m currently working on including more ambient audio in SP_Apartment and SP_City to give it a bit more life and progression. This week I have been polishing the new zombie archetypes (including more fun headshotting for soldiers), optimizing the sound usage of zombies, reworking the movement checks of zombies (no more swiping the air if player gets off navmesh, no more getting stuck inside geometry), fixed the door breaking intro sequence (this time for good hopefully), reworked the way the character spawning checks to avoid zombies being (de)spawned in player sight, and improved the melee check logic on zombies for better initial melee distance from player. This week I fixed several bugs connected with death animations, post death gibbing, physics jitters when zombies were accelerating / decelerating and a rare case where walker was able to walk even though both of his legs were gibbed. I completed a quick rework of Manuel (Survivor in the outbreak campaign Mission) animation framework. Now it is properly synced to his voice lines and player can murder him at any point if he wishes to. 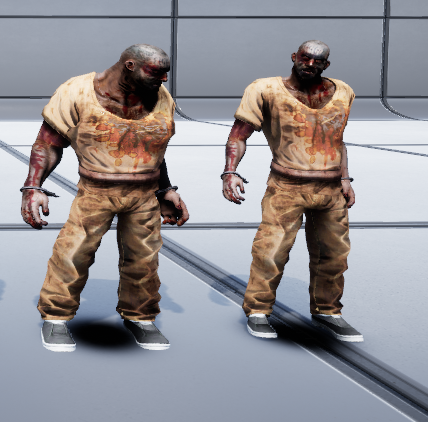 This will be a new “Beefier” zombie normally wearing inmate clothing that should be a moderately bigger threat to the player once final balance pass is complete. And I finished the work on the physical Assets for all the existing zombie models. Now all the characters we had before are Melee System compatible with those sweet physics reactions and will reappear in the game for you to kill!